Although insect repellents can prevent various insect bites, sometimes, you just can't stop the menace of getting bitten by these bugs. The most common occurrence when an insect bites is a rash. These bug bite rashes are red and cause itchy bumps on top of the skin. 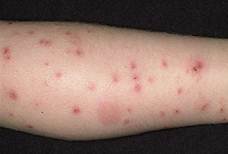 The rash is, in fact, an allergic reaction to substances that enter when the insect bites. Most insect bites cause a mild reaction while others cause serious, sometimes, life-threatening reactions. This article provides you with some of the common insect bites to be aware of. Bed Bugs are parasitic insects that feed only on blood. 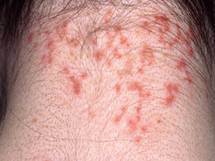 When bitten, the skin erupts in circular and orderly row of red bumps. 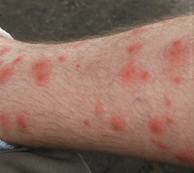 The rash can also cause itchiness, swelling and redness an hour after being bitten. 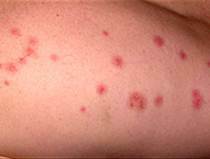 The rash may disappear after a number of days if the infestation of bed bugs is taken care of. However, if the infestation continues, you run the risk of getting bitten often. Mosquitoes are usually harmless creatures. However, there are certain types of mosquitos that cause various fatal illnesses such as Malaria, Pilaria and Dengue fever. Red, itchy marks may appear on the skin as a reaction to a mosquito bite. 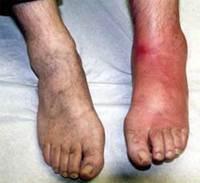 Some people suffer greatly with mosquito bites due to severe swelling that result due to severe allergic reaction. 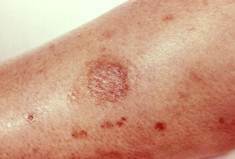 This kind of bug bite rashes will disappear by themselves without treatment, after a few days. Chiggers, larvae of mites, feed on fluids in skin cells and reside in damp areas with dense vegetation. When chiggers bite, it leaves red, itchy bumps on the skin. You may suffer for several hours with itching. 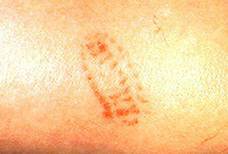 At the same time, you may also see small, red, lesions around the bitten area. 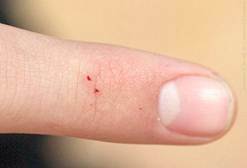 Scratching the area despite itchiness as the rash may worsen and lacerations from nail marks may cause infections. Chigger bites usually take 2 to 3 weeks to disappear. These are small insects that are very similar in appearance to spiders. They feed human and animal blood. Most often, you may not feel a tick bite. You may, however, feel a lump on the skin which is actually the tick attached to your skin. Most ticks are harmless, although some ticks carry serious diseases, such as, Lyme disease and Colorado tick fever. 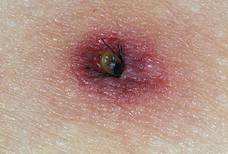 If you have Lyme disease, you may experience a rash on the skin with fever. The rash is flat and round with a patch in the middle. The rash may disappear after a week or two. A flea is a tiny brown bug. These bugs too are blood drinking parasites. If you experience small, bleeding, itchy bumps with a puncture in the center, you may have been bitten by a flea. The rash may disappear after a few weeks. It is very rare to be bitten by spiders. Spiders are harmless generally although the Black Widow and the Brown Recluse Spider are extremely dangerous. If bitten by a Black Widow spider, you may see two red fangs and redness. If you are bitten by a Brown Recluse Spider, you may experience pain, blisters and a red bug bite rash. Severe allergic reaction to the venom of the Brown Recluse Spider results in elevated blood pressure, joint pain and nausea, which require medical attention. Often, head lice hide in the scalp around the neck area or behind the ears. You may get head lice by sharing personal items such as brush, hat, or others with whom has lice. Lice can't carry illness, so they don't cause severe problems. When got lice, you will experience irritation and intense itching of the scalp, skin rashes on the nape of the neck. Scratching the scalp can cause infection and, in serious cases, hair loss. When biting people, common types of bees lose the stinger and then die. However, a wasp, yellow jacket or hornet can sting multiply as it doesn't lose its stinger which can lead severe reactions to those who are allergic to the toxin of the sting. When stung by a bee, you will undergo skin rash with pain and swelling caused by both mild and severe reactions. This is a normal reaction to bee sting. A localized swelling refers to rash coupled with swelling over a large surface area, which is not serious case. A serious allergies caused by the sting of a wasp, yellow jacket or hornet can lead to symptoms including itchy, red skin rashes or hives, coupled with dizziness, rapid pulse, swollen throat or face, difficulty breathing or swallowing. Often found in the Southern states, fire ants look much the same with the ordinary ants. When disturbed, they attack people by using jaw to latch onto the skin, and sting by injecting venom from the abdomen. 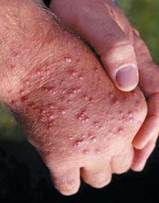 If stung by a fire ant, a skin rash with possible form of red and pus-filled blisters will appear. The blisters look much like a boil, having a white tip. And they may be itchy, painful, and have a burning sensation. The sting area may be swelling too. The poison of caterpillar is hidden in the hollow spines of the hairs. When stung by a caterpillar, you will experience skin rash in the sting site. The non-sting sites may also have this symptom. Common affected areas including arms, legs, chest abdomen and back are caused by a caterpillar sting. The pus caterpillar is the most poisonous type among all caterpillars in the U.S., whose stings can lead to waves of rash, fever, vomiting as well as muscle cramps. While not all insect bites result in reactions, some may actually cause severe reactions to insect bites instead of just bug bite rashes, which can result in following symptoms. In such situations, immediate medical assistance may be needed as the venom can be fatal. Treatment for insect bites depends upon what insect has bitten and how sever the reaction is. While there are numerous ways to treat insect bites, the suitability depends on what the insect is and how the person bitten is affected. Mild local reactions can be treated with cold compresses, oral painkillers, or calamine lotion or any other topical cream. Home remedies include the application of a paste of baking soda and water or quick lime. This reduces itching and prevents bacteria build-up. Serious reactions require immediate medical attention. If a venomous insect as a black widow spider bites, do not wait for other symptoms such as, seizures, stomach cramps and vomiting to begin. Rush to the nearest emergency room for anti-venom. Apply a tourniquet to restrict the circulation of blood and keep calm to avoid fast spread of venom through the system. Insect bites can be painful and itchy in general and fatal in certain cases. The severity of the condition depends upon the insect and the person's reaction level. It is imperative to find out what insect has bitten in case of painful bites resulting severe reactions. Seek immediate medical assistance in situations of sever discomfort and reactions while home remedies and OTC anointments can sooth mild discomforts.